Taken c1888. See also Views by Barber. 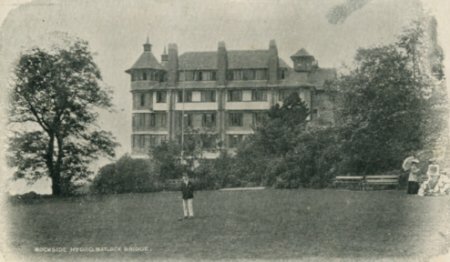 This is the original Rockside, opened by Charles Rowland in 1862, but extended backwards after the removal of a row of houses. The familiar tower was built later. 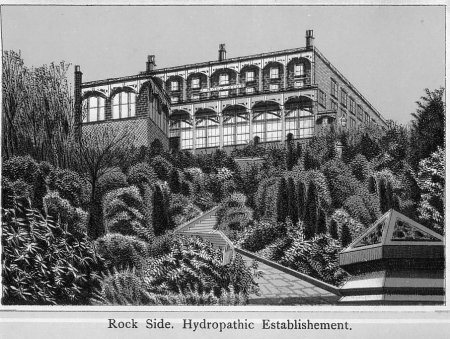 The second largest Hydro in Matlock. From an unused real photo postcard believed to date from the 1930's, made by Jackson & Son of Grimsby & Bradford. 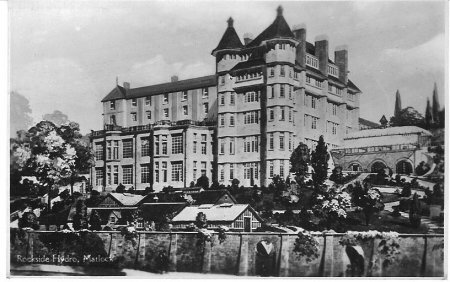 Rockside was built by Charles Rowland, and opened in 1862. 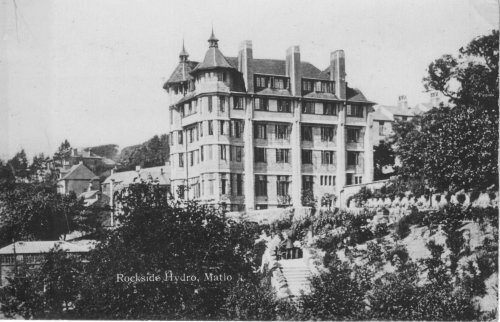 See the very interesting Census for Rockside for 1871, 1881, 1891 and 1901. 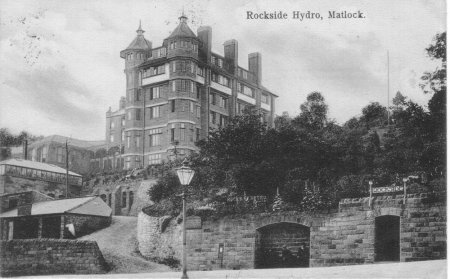 Rockside Hydro is still there ..just! Walked passed it last week and it is in a very sorry state. I believe it has been bought and awaiting renovation when at the present it is in a state of devastation. Whole sides missing and an extremely dangerous place to be in. Its collapse could happen at any time one would think. It is closed off and the grounds have become dumping grounds for the usual stuff....matresses,tyres,bike parts etc. Posted 4 Sep 1939. 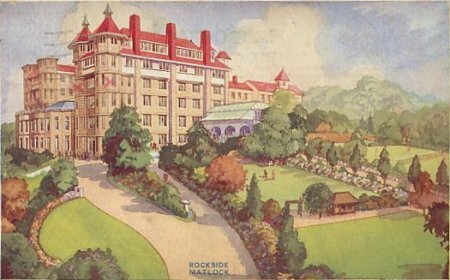 In the Second World War, Rockside was used as an RAF hospital for air-crew suffering combat fatigue. It was officially called a Neurological Hospital. This may explain the cheerful colours used on this postcard. It is addressed to: Mr Hunt, 4 Langton St, Chelsea, London SW10. and reads: Neurological Hospital, Matlock, Derby. Hello Folks, Just a line to let you know where I am. This is quite a nice billet. Love, Terence. Look carefully, Terence has put two red crosses on each side of a third floor window, where he must have been a patient. 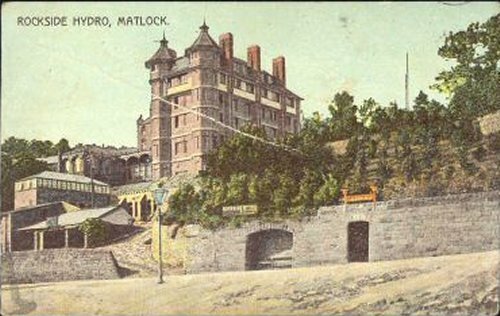 The view from that window must have been the best in Matlock. It is addressed to: Mr G Clifton, 35, Kirkby Road, Sutton in Ashfield, Notts. and sent from Blackpool. There is a lot of writing on the back, signed by what looks like E.A.M. Posted 1905. On the right, a group of attractively dressed ladies.